Construction of the CSS Neuse began at Whitehall on the Neuse River. Following an attack by Union troops in December 1862, construction was relocated downriver to Kinston. Image courtesy of CSS Neuse State Historic Site, Kinston, NC. 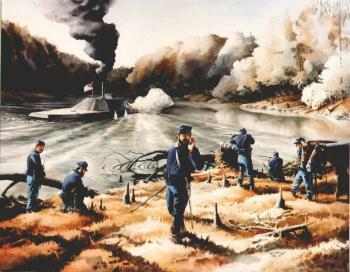 In its final mission, the crew of the Neuse covered the Confederate retreat from Kinston by shelling advancing Union forces. Image courtesy of CSS Neuse State Historic Site, Kinston, NC. Salvaged in the 1960s, remnants of the hull of the Neuse can be seen at the CSS Neuse State Historic Site and Governor Richard Caswell Memorial. Image courtesy of the CSS Neuse State Historic Site, Kinston, NC. On October 17, 1862 the Confederate Navy Department signed a contract with the shipbuilding firm of Thomas Howard and Elijah Ellis of New Bern to construct an ironclad gunboat on the Neuse River: the CSS Neuse. 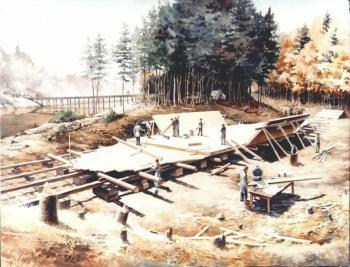 The boat’s hull was to be completed by March 1, 1863, so work began at Whitehall (present-day Seven Springs), shortly after the contract was signed. 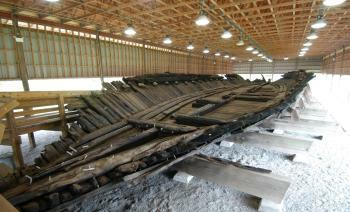 The ship’s design called for it to be 158 feet long and thirty-four feet wide. Confederate naval officials worried that Whitehall was vulnerable to attack. Indeed, it was. Targeting the Wilmington Weldon Railroad Bridge in Goldsboro, U.S. General John G. Foster led an expedition from New Bern beginning on December 11, 1862 and reached Kinston on December 14. Moving up the Neuse River to Whitehall, the Union soldiers came upon the ironclad and seized and burned construction materials. On the morning of December 16, the Neuse suffered shot and shell damage from the heavy fighting that occurred at Whitehall. The next day, Federal troops headed toward Goldsboro. Work on the ironclad continued but the completion date had been delayed. In mid-March 1863, the hull of the Neuse was sent downriver to Kinston. For various reasons, further construction of the Neuse was delayed after it moored near a steep riverbank in Kinston so that machinery could be lowered into its hull. The boat’s first commanding officer, Lieutenant William Sharp, obtained iron so the ship could be completed. Work progressed steadily during the summer and fall of 1863, yet the Neuse‘s construction fell behind schedule. So, in February 1864, General Robert F. Hoke detailed ninety-five carpenters and mechanics and fifty laborers to work on the gunboat. A lack of crewmembers presented problems, too. Sharp’s twenty-eight men were mostly officers and petty officers, so he, as did many Confederate captains, increased their ranks by borrowing men from the Confederate army. As was to be expected, the new crewmen’s inefficiency disappointed the officers. In February 1864, when Sharp was transferred to another duty station, the Neuse received its second commander, Lieutenant Benjamin Loyall; however, construction delays and unfortunate circumstances contributed to the lackluster performance of the ironclad. Although two 6.4-inch Brooke Rifles were in place by March, work had slowed because iron was not arriving fast enough for the builders. Even so, on April 22, 1864, the Neuse was ordered to help recapture New Bern. Scarcely one-half mile downriver, the ironclad grounded on a sandbar. Multiple attempts were made to free the boat, but only a rising water level freed the vessel. Finally, the river rose in mid-May, and the Neuse returned to its moorings in Kinston (The action at New Bern had been abandoned). A restless Loyall was given a new command in August, and Captain Joseph Price, a Wilmington native, was recalled from the Savannah Squadron and named commander of the Neuse. By February 1865 U.S. General William T. Sherman marched his Federal troops into North Carolina, and the crew of the Neuse prepared for what became its final mission. On March 6, U.S. General Jacob D. Cox left New Bern with two divisions (13,000 men) to meet Sherman’s forces near Goldsboro, and Hoke’s division gathered at Kinston to stop Cox. The Confederates, however, were defeated at the Battle of Wyse Fork (March 8, 9, and 10), and C.S. General Braxton Bragg ordered troops to evacuate Kinston. Ordered to cover Hoke’s retreat and prevent his vessel from falling into enemy hands, Price and crew shelled the advancing Federal cavalry on March 12 and then scuttled the Neuse. The machinery, armor plating, and guns of the Neuse were salvaged immediately following the war, yet no serious attempts were made to restore the ship until the mid-1900s. The gunboat’s remains were salvaged in the early 1960s, and the hull was moved to the Richard Caswell Memorial Park in 1964. Since then, it has been the centerpiece of the CSS Neuse State Historic Site and Governor Richard Caswell Memorial in Kinston. Leslie S. Bright, William H. Rowland, and James C. Bardon, CSS Neuse: A Question of Iron and Time (Raleigh, 1981); A. Robert Holcombe, Jr., The Evolution of Confederate Ironclad Design (Greenville, 1993); and William N. Still, Jr., Iron Afloat: The Story of the Confederate Armorclads (Columbia, 1985).